The C track topic - ideas, uses, and innovations. marklin-users.net community | Forum » General topics » H0-scale » The C track topic - ideas, uses, and innovations. I want to be able to see a concentration of knowledge and ideas on Marklin C track in this forum. It is such a marvellous product, it deserves a topic on its own. And also, many members here have some innovative, bright, and unique ways to use C track. I will start the ball rolling, by reference to a previous topic. "Disapointing the expansion of C-track isn't there. 24906, 24032, 24724, and so on, where are they?" Let us hope Marklin announce them sometime in the future. I inadvertently created a short on my layout, when using C track. The metal tongue for the overhead catenary mast in this location, just happened to bridge (and short) the wire connectors under the track. The photos explain the solution. Edited by user 21 January 2015 21:14:33(UTC) | Reason: added "metal"
We ought to borrow some images from those topics. Wye or Y are a great use of space (probably about the same as a turntable without storage). Why do we use them?? (sorry could not help that one). 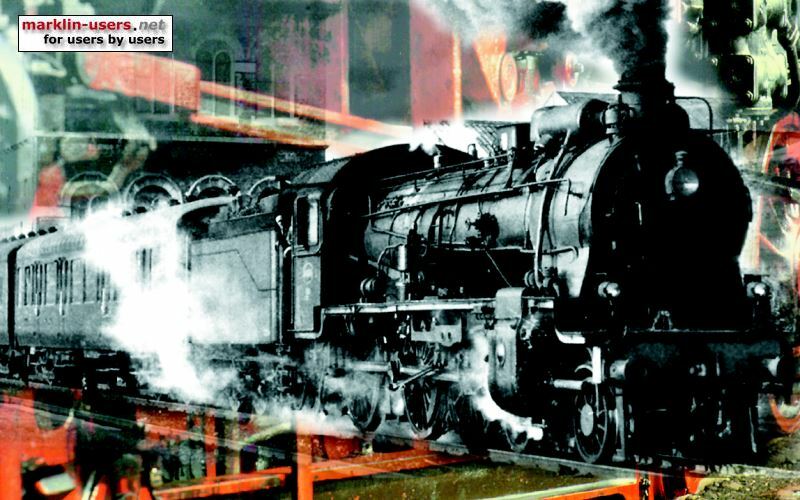 You get to easily turn a loco, and so simple to set up in the Marklin system. This is the wye usually used. It is not symmetrical but works. This one is symmetrical off a straight section, but uses a 3 way turnout. I have not tried this configuration. And the 3 x 24230 can be exchanged for 3 x 24130/24330/24430/25330, respectively. In this spirit I attach the most compact 90º wye I can think of. A space-saving and daring combination which I employed in the shadow station area of my former layout Humbug-Dummtor. Actually an iteration of the asymmetrical wye presented by Kimball above. - On the left: 24711/2 slim turnout with two 24206 instead of a 24912. - On the right: 246711/2 curved turnout with two pieces of 24912 which - as a bonus - offers elegant easements at the end of a curve; like that even coaches have a nice appearance despite the use of R1 based turnouts. 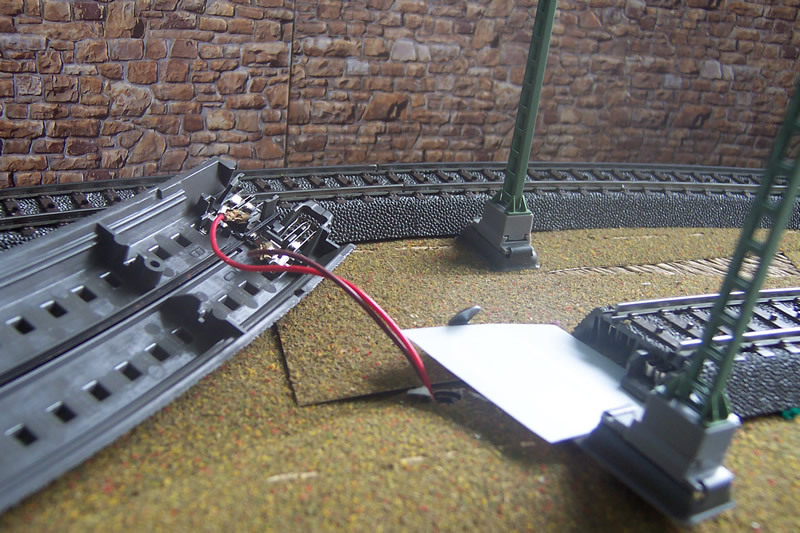 Building a yard ladder with reduced clearances between tracks by combining 24611/2 with 24711/2 turnouts and double 24206 combinations introduced above. 24906 - this is half (6°) of the large radius curve 24912 (12°). This half curve will allow you to complete 30° of a large radius curve, with 2x24912 + 1x24906. By extension you can complete a corner (90°) with 7x24912 + 1x24906. 30° is the most useful curve, because it fits with all other radii (30° in R1 through R5) made by Marklin. Therefore it can be used as a transition for the smaller radii in a 60° or longer curve. (Note: in my opinion a 24903 (3°) might be more useful, allowing short transitions for R1 and R2 where you have 15° sections available. 24032 - this is half the shortest straight piece currently available (24064), and will assist in many areas of widening distance from turnouts, between parallel tracks. For example, for a station platform. 24724 - I am not sure what Leo has in mind here, perhaps he will join this topic at some point. And from a pure mathematical point of view, a Wye is a triangle, and all the angles subtending the curve pieces add up to 180°. And it does not matter which radius curves you use! In this example we have 60° for each side of the Wye. Moderator David (member Bigdaddynz) posted this in another topic, regarding possible Marklin releases this year. Articles are slim (R9 large radius) double-slip turnout, and R4 curved turnout. Straight Track with removable embankments. Is required as a balancing item for the slim double slip switch 24720. - Price: N. E.
Right Curved Turnout, R4 = 579.3 mm / 30 °. Outside bend 30 ° at a parallel distance 64.3 mm. Manual hand lever. Electric drive 74491, 74461 digital decoder and Weichenlaterne 74470 - Price: nE"
Why not another wye? Here a practical application for the gent with lack of space: In the most compressed version, the two mainlines could be connected by closing a simple circle. And the inside of the circle could be filled with track, too, thanks to the 24649 crossing. I thought there was some mention of this in the Messe thread, something about possibly later in the year. The author proposes to use M* 24236 for a radius >= 2000 mm and M*24912 for radius between 900 mm and 2000 mm. Hmmmm.... I cannot see the efficacy in doing this. A lot of work for very little return, compared to the use of K flex track, or even Peco track with centre studs. Why don't Marklin take a leaf out of Kato's N scale book and make some structures which are specifically designed to work with C track? I know you can buy stations, engine sheds and so on from multiple manufacturers, but every time you have to build a base to lift them up to the C track rail level. If you look at Kato they sell a station pack which is specifically designed to be used with their track system. The basic one will fit inside the passing loop expansion pack (like C2), you can buy extra platform sections, a ticket office which sits above the line, and assorted other bits to build precisely what you want. It all clips together (the Japanese model railway culture is based around carpet layouts, they don't generally have the space for a fixed one) and you can make it look very realistic with painting and figures. Start with platform segments which equate to 24188/24172 and a ramp for each end (make a left and right hand curve to fit at the ends of a loop using the R2 points, and make the segments the right width to fit between the straights), a canopy and basic details like name boards, bike racks, and posters. Have an "underpass" entrance to explain how people get to the island platform. I have seen the "My World" range but it's obviously aimed at the toy market, with chunky overscale components. I'm thinking something which can be used as-is or made to look much better with some work. I think that is seen as 'operating outside their core business' which is the trains themselves. There are enough manufacturers (of the accessories) in Europe for everyone to have a slice of the pie without going outside the core business. There is only so much a company can do with its R&D effort. 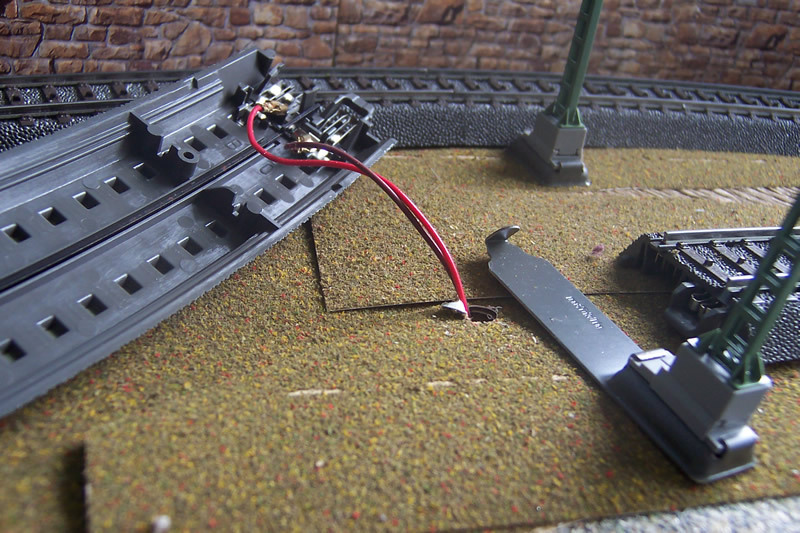 And then when it comes to using other manufacturers items with C track, there are some items specifically designed for C track, but they are limited, as the manufacturers have to make the models fit a wide range of model railway track systems, wether it is C track, M track, K track, Roco, Fleischmann, Bemo HOe, Lilliput, etc which all have varying heights for their track system. So the only way they can operate economically is to design for the lowest profile track and have the modeller set up the model to suit the track system they are using. Besides which, having a station building a bit higher than the surrounding land level would not look out of place, in most places, especially in Europe, the ground undulates to some degree. So as I have often said - you cannot make a mistake with scenery, whatever you do there will be a prototype for it somewhere. C-track point-to-point on 130 x 160 cm - just for inspiration. Sorry for the lousy resolution. When used to connect terminus to mainline, replacing 24640 on terminus leg by 24620/24624 allows to reach all terminus tracks from mainline. Q: Now what might be useful for? A: For creating a "internal" twisted return loop layout allowing to turn a train in any direction, in fact a twisted dog bone design; employing sprung turnouts, the return blobs can be used without switching - see sketch. Track length to be extended by inserting further pieces of straight tracks. Same applies to ladder by inserting further 246xx turnouts. The depicted arrangement requires a 30 x 200 cm surface. Space requirement for this nucleus: 171 x 130 cm. Hear, Hear. I think a thread dealing specifically with C track should be a sticky at least if not a separate topic. Extending the nucleus to 181 x 130 cm allows putting the inside of one of the circles to good use. On a layout, the idea is to hide at least some of the inward pretzel to fool the eye about trains being turned around. After the prototype, a complete height-adjustable track helix has now been created. Time for a few pictures of the construction: The image shows six levels, a maximum of seven is possible. The helix climbs a height difference of 25 cm to 55.7 cm. The basic structure of the pillars is already known from a prototype. I only made cosmetic changes. New is the entrance with its opening [editor - see pic below]. During construction, all the pillars are put together. Then you start with the entrance and build sector by sector, always working from the bottom to the top. A sector comprises 60 ° or 90 °. As soon as the circle is closed, the twelve pillars stabilize each other. It is therefore important that the tracks are in good condition. Those with damaged trackbed are completely unsuitable. At the top, the track is exits via a bridge. Here we see an older design which has not yet been constructed as a half-timbered bridge. Where another pillar is visible in the picture, a table or other piece of furniture could be found during "Teppichbahning". The bridge can be hinged into any pillar. The height difference can be set in steps of 6.6 mm. The cutting sheets have been reworked by me. A few detail errors had to be corrected. In addition, all of the connecting members were shaped differently so as to slide more easily into each other. The finished files can be found in the download area." Neat solution. I also liked his little bit to fit to points to stop wheels shorting to the studs. So I guess the radius (R1, R2... whatever) is immaterial to the success of the structure. I have just spent a profitable hour hunting down and studying old posts and threads here dealing with C-track return loops, a subject which is of current practical interest to me. This leads me to repeat my support for your suggestion of a separate topic or even sticky on C-Track Geometry, Problems and Solutions, where all this great information could be concentrated in one place. The drawback of that suggestion, IMHO, is that it would just add another link to a chain of links which I have found at this time, and which in its turn would have to be dug out individually by some future searcher for such info. If there were a separate topic or a sticky the searcher could home in on the relevant info immediately. If there were a separate topic or a sticky the searcher could home in on the relevant info immediately. I think sticky topics are over-estimated. If there are more than 10 stickies in a forum, most people will ignore them anyway. It is difficult to find a specific post in a single thread with 1000+ posts. A single post with 100 uncommented links is not better. In both cases, an index post with links and descriptions would be helpful. But such an index requires a maintainer, a volunteer who does it manually. Agreed - for a good topic coverage post, one needs a curator that will go back and edit their main post to include the information gathered and submitted into the thread, such that the top post or two become the definitive table of contents and synopsis of what a link points to at a minimum, if not links to other posts in the same thread with the details. Fair enough, I don't know how it would be best done. But since track is so fundamental to all MRR, and I have found much useful information on track here, I just wanted to suggest it would be a good idea if it could be grouped in some way for easier reference. I don't want to harp on about it. Of course I can host a website within the "limits" of marklin-users.net. The only restriction is that PHP is not supported since the site resides on a Windows server that I do not own, I rent the space and an IP address for a rather reasonable price. The few site pages that are not forum pages are Asp.Net MVC 3, but are in the process of being upgraded to MVC 5. I have the green light, so I will start work on the website during November, please email me the track diagrams, tips and tricks to an email address I have set up specifically for this. I will convert the pieces into SCARM (as I am most familiar with this) and place them on the web pages. I think we should just use it for tips and tricks with C track, so no complete layouts please. Anything to do with C track though is OK. I will of course go through the User group site (and links) and collect C Track examples. Excellent initiative. SCARM does not run on my Mac. Would you consider to publish something mortals like me could admire, too? I will only use scarm to do the track design in a easily visible standard form. Then I will put it into a JPEG to display the design on the webpage. So this will not be a problem for mac users. Yessir, that's a great initiative. I will forward the C-track posts that have interested me, and I trust you will bear with many items that only duplicate what your own researches have already turned up. Awesome. Comes just in time for my layout build in 2017. I've sent you two tips to see if it's OK.
Will you receive anyrail-based files? This page was generated in 1.210 seconds.